* STRENGTH – 8x stronger than vinyl. * NO FINISHING REQUIRED – Ultrex on the interior and exterior. * DURABILITY – Ultrex resists rotting, warping, corrosion, or denting and is highly resistant to fading. * LOW THERMAL CONDUCTIVITY – 500x less conductive than aluminum; less than 1/3 the conductivity of glass; similar to wood and vinyl. * STABILITY – minimal expansion/contraction is virtually the same as glass for tightly sealed units with consistently easy operation – resists bending, buckling, twisting, or warping in extreme conditions. 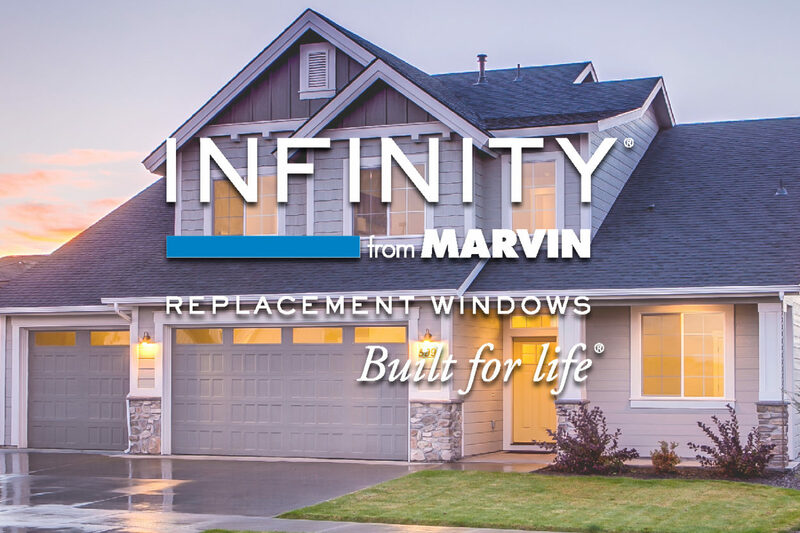 Fiberglass materials used in the manufacturing of Infinity from Marvin replacement windows go through a Pultrusion process. Pultrusion is essentially a continuous molding process using fiber reinforcement in polyester or thermosetting resin matrices. Heat is used on the “thermoset” resins, in the fiberglass Pultrusion process, to cause a chemical reaction which permanently sets the shape of the part. Once the part is cured, it cannot be reformed; this process is irreversible. Pultruded fiberglass materials are primarily a composite of glass fibers and resins. The glass used in fiberglass, while basically the same core material as that used in flat glass, comes in a different form – rovings – or also known as fibers. This form of glass begins as a finely ground, flour like material composed of Silica and Zironia. The “flour” is heated and melted at approximately 1500° C, and the resultant molten glass is passed through small holes forming hair like filaments. The filaments are collected together, grouped and a binder is applied to bond them into strands. Then the strands are heat cured, wound together and rolled up into a cylindrical package. These fibers provide the bulk of fiberglass profile’s longitudinal strength. The majority of resins used for fiberglass window profile Pultrusion are classified as polyesters. Polyester resin is one of a group of synthetic resins which undergo polymerization during curing. They provide excellent adhesive properties, high strength, and good chemical resistance. These high performance polyester resins are then mixed with suitable fillers and pigments to formulate the resinous matrix. The formulations are optimized for the particular application. Which means that our windows and doors stay tight and true even after extreme temperature swings. Ultrex expands at virtually the same rate as glass and maintains a tight seal, so it’s resistant to leaks, seal failures, and stress cracks that can compromise energy eficiency and long-term performance. Fiberglass has an amazing strength-to-weight ratio, which is one of the reasons why it’s the material of choice for boats**, bridges, guard rails, and ladders. It’s highly durable, doesn’t corrode, resists rot, and resists expanding and contracting in temperature swings. “Infinity windows and doors are made with Ultrex®, a patented pultruded fiberglass with acrylic capping. We use Ultrex and our proprietary pultrusion process to manufacture high-performance windows and doors that endure heat, cold, wind, and rain without wearing out. Though we are dedicated to leading the way in innovation, we never forget the cornerstones of our business. We are highly selective in choosing our business partners – independent, locally-owned installing retailers – to ensure our customers have the best experience possible. Infinity from Marvin creates products to be easily installed and operable with virtually no maintenance required. Our values and work ethic are forged by the communities where we’re proud to make our quality products. When you choose Infinity windows and doors, you support a small-town, family-owned and operated company with deep roots in the community. We share profits with our employees; we support our communities; we treat our retailers and customers fairly and with respect.